Four television screens showed the same short video: a girl doing gymnastic splits exultantly in a squeaky new subway train. It was shown by Yu Weiping, Vice President of CRRC Corp., China's largest rail transportation equipment maker, to an international audience at a discussion session at the BRICS Seminar on Governance in Quanzhou, southeast China's Fujian Province, on August 18, to press home a point. "That subway runs so efficiently that the girl couldn't help making that gesture [of pure joy]," Yu explained. It was a Swedish girl having fun in Rio de Janeiro, Brazil, during the 2016 Summer Olympics. "It has been built by CRRC. There were zero breakdowns on that line during the entire Rio Olympics, which won the applause of Olympic fans worldwide." CRRC, which exports rail transport equipment to 101 countries and regions, is focusing, like so many large Chinese enterprises, on deepening partnerships in the other four BRICS countries—Brazil, Russia, India and South Africa. In India, for example, where CRRC has been supplying subway trains, locomotive engines and other railway vehicles and parts since 2007, it launched a joint venture (JV), CRRC Pioneer (India) Electric Co., to begin manufacturing in India for the first time. The JV began operations in 2016, two years after Prime Minister Narendra Modi launched his "Make in India" initiative. CRRC holds 51 percent of the stakes in the JV, which has a total investment of $63.4 million. The trade between China and India exceeded $70 billion in 2016, according to a report released by the Embassy of India in China in February. Yu said BRICS countries enjoy four advantages: huge markets, huge regional influence, well-developed industries and skilled technical teams. CRRC is also partnering with South African companies to export products to neighboring countries in Africa. Not only large state-owned enterprises like CRRC, but private companies are also seeking cooperation opportunities in the bloc. Lin Xiaofa, Chairman of the JOMOO Group, which makes kitchen and bathroom products for intelligent homes, said his company has been establishing partnerships in BRICS countries since 2012. "We can use our China business model as a reference when we do business in those countries," he said. The gains are mutual. For instance, according to statistics from Brazil's Ministry of Agriculture, Livestock and Supply, China's agro-imports from Brazil reached $20.83 billion in 2016, accounting for 24.5 percent of Brazil's total exports, up 0.4 percent over the previous year. Beans, chicken, sugar and beef were the main items. However, there are challenges facing BRICS, such as the weak external demand as the world economy remains in a period of recovery and deep adjustment. Besides, investment relations among BRICS are not as close as among regional groups such as the Asia-Pacific Economic Cooperation. Also, their business environment needs to be improved, given policy restrictions in areas such as market access, taxation and visa issuance, according to the 2017 BRICS Sustainable Development Report published by China Development Bank's Financial Research and Development Center and the China Council for BRICS Think Tank Cooperation. "I think there will be efforts and announcements in Xiamen for further economic integration among BRICS countries," Srikanth Kondapalli, professor in Chinese studies at the Jawaharlal Nehru University in New Delhi, told Beijing Review. Since the BRICS group of five emerging economies was completed in 2010 with the addition of South Africa, the last entrant, their contribution to the world economic growth has exceeded 50 percent, with their combined GDP accounting for nearly a quarter of the global total. 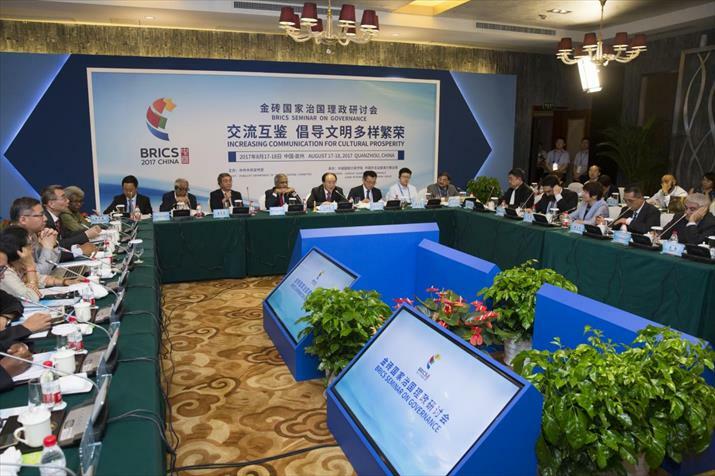 "BRICS countries are the economic bellwether of the world," Huang Kunming, Executive Vice Minister of the Publicity Department of the Communist Party of China Central Committee, said in his keynote speech at the opening ceremony of the two-day seminar on August 17. 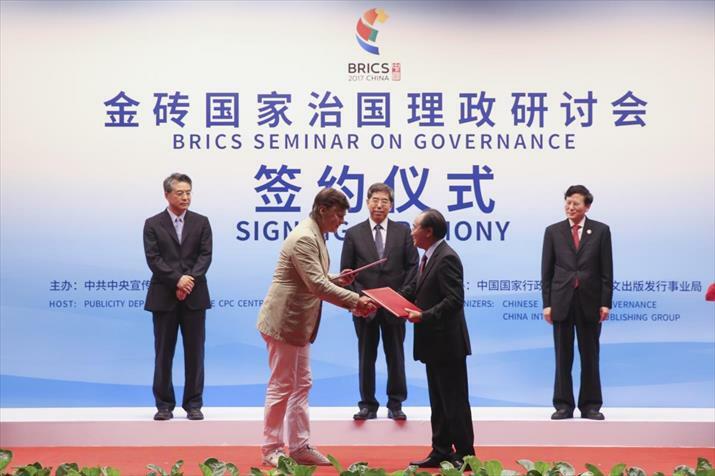 Organized ahead of the Ninth BRICS Summit to be held in Xiamen, a major trade hub in Fujian, in early September, the seminar, themed "Openness, Inclusiveness, Mutual Benefit and Win-Win: Working Together to Build a Community of Shared Future for Mankind," was a platform for experts from government agencies, business circles and the academic community in BRICS countries and beyond to share their views on global issues ranging from trade and economy to poverty alleviation, equality, cultural communication and environmental protection. "Developing countries can identify with the objectives of this seminar: building a shared future for mankind, with transparency, openness and inclusiveness in our cooperation, with mutual benefit and win-win for all," Mizengo Pinda, former Prime Minister of Tanzania, said. Jorge Eduardo Navarrete Lopez, former Mexican ambassador to China, said global problems can't be solved by any one country or regional organization. Global governance requires the joint efforts of the entire international community. Trans-regional multilateral mechanisms represented by BRICS can play a big role in building a new framework of global governance. "BRICS member nations have been cooperating with each other in more fields than just trade and economy, demonstrating their determination to forge ahead together in the increasingly complicated international environment," he remarked. While sharing common challenges, BRICS nations have their own unique problems as well. "We can learn from each other's good practices and draw lessons from mistakes," said Wang Gangyi, Vice President of the China International Publishing Group (CIPG). The seminar was co-hosted by CIPG and the Chinese Academy of Governance. BRICS is not an exclusive association. Efforts are on to expand the friends' circle of BRICS by exploring a "BRICS+" model, which could become one of the most influential platforms for South-South cooperation, enhancing the BRICS mechanism. "[By establishing] a wider partnership with other developing countries [with] the BRICS+ model, the five countries can reap rich fruits in bilateral and multilateral investment," Sergey Karataev, head of the Department of Economies of Foreign Countries at the Economic Research Center under the Russian Institute of Strategic Studies, told Xinhua News Agency. Robert Lawrence Kuhn, Chairman of Kuhn Foundation, said at the seminar that Chinese President Xi Jinping was proposing a "grand vision of global governance" with China playing a dramatic new role in seeking global win-win cooperation. "China does not claim that constructing a new order of global governance will be accomplished easily or quickly, but it is highly significant that President Xi is making a major commitment in dedicating China to participate actively and to take serious responsibility in this vital initiative for world peace and prosperity," he added. "As the world considers global governance structures, including BRICS, China's experience can make a vital contribution."